Dice is a male Labradinger (Lab/Springer mix); DOB 2014. Up-to-date on vaccinations, neutered, micro-chipped. Dice does have a bite history and is a bit nervous around strange men. Dice was initially surrendered by his first owner due to lack of time to spend with an active puppy and then adopted by a young college student. The college student made a poor decision to bring Dice home and then throw a party where Dice was thrown into the mix of new surroundings, lots of young partying people, loud music, etc - Dice got spooked and nipped at someone. The college student then decided that she no longer wanted Dice and this is where GGOH came into Dice's life. Dice was then adopted out to another family and had a bit of a rocky start with a younger child who did not heed Dice's warning signs and was once again, returned. Dice has since been through vigorous temperament testing with a trained professional and has not acted out in any way - he has passed all tests but his training will not stop here - we will continue to work with Dice so that hopefully his next adoption will be a permanent one. Dice really is a very good dog, he's just been put in tough situations - we are certain with proper training (of dog and of owner) and proper introductions to new environments, Dice will do just fine. 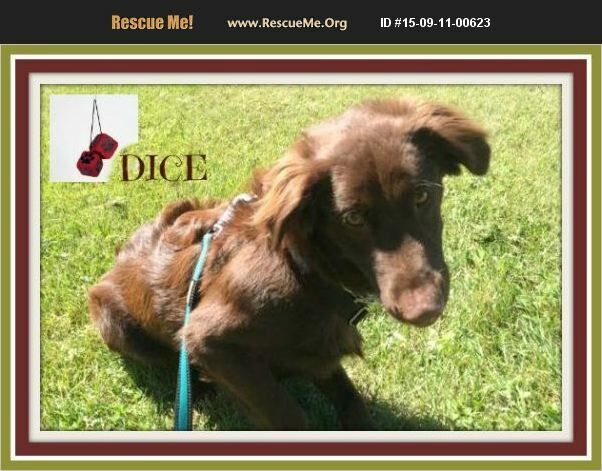 Our recommendations for Dice is that he be placed in a calm environment, preferably a home with no other dogs and absolutely no young children as they do not understand dog behavior and therefore, could entice an altercation. Dice needs a committed, experienced guardian/handler who is willing to work with him and continue his training. Although we do know that Dice gets nervous around strange men, we have seen that with proper introductions and given adequate time to adjust, Dice can be accepting of them. Dice is a special case, no doubt, but we are confident that there is a home out there for him. PLEASE READ OUR ADOPTION PROCESS INFORMATION BEFORE SUBMITTING ANY COMMUNICATION OR APPLICATION TO US. Thank you!